In a bruising battle filled with 63 personal fouls and nine players fouling out, the top-ranked Dietrich Blue Devils (21-2) won their first Northside Conference in 21 years Wednesday night by a 58-49 score over the three-time defending champ Carey Panthers, at Gooding High School gym. Coach Wayne Dill’s Blue Devils earned an automatic berth to the eight-team State 1A Division 2 tournament Feb. 28 at Caldwell High School. Last year Dietrich (20-6) fell to eventual state runner-up Carey 38-36 in the state semi-final and then captured third place 40-39 over Castleford’s Wolves. Wednesday’s outcome in the Northside championship game meant that Carey (14-9), seeking its 17th state tournament berth in the last 21 seasons, needed to beat No. 3-seeded Lighthouse Christian (18-6) Thursday night in order to clinch another trip to state. If Carey lost to Lighthouse Thursday at Gooding, the Panthers have one more chance for state Saturday, Feb. 23 in an inter-district state play-in game against the eastern Idaho runner-up team, that game set for 1 p.m. in American Falls. Dietrich’s arsenal of weapons was too deep for Carey on Wednesday, with sophomore Trey Dill scoring 17 points, junior Jacob Dalton 14 and senior Kayden Power 14. Carey got most of its production from young players, too, led by sophomore Nate Adamson 19 points, freshman Joe Parke 12 and soph Matt Whitworth 10. Still, No. 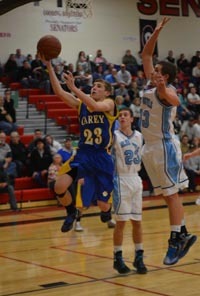 2-seeded Carey used tough defense to slow No. 1-seeded Dietrich and its 72.3 ppg offense. Dietrich led 27-21 at half, but the Panthers cut the deficit to a single point in the fourth. Dietrich out-scored Carey 12-3 at the free throw line, like the Devils outscored Carey at the line 23-7 during their 90-51 home win Feb. 8. After its 69-50 semi-final loss at Carey Monday night, Lighthouse stayed alive 67-57 over No. 4-seeded Richfield (8-11) on Tuesday night and also won 64-61 over No. 5 Castleford (10-12) on Wednesday to set up its rematch with the Panthers. Lighthouse in winning its rubber game of the season series with Castleford made it seven wins in the its last nine games.